1. A can finish a work in 12 days. B can finish the same work in 8 days and C in 15 days. A and B start the work but they leave after 4 days. How many days C will take to finish the remaining work? 2. Anil purchased a computer for Rs. 35000 and sold it at a loss of 8 %, with that money he purchased another computer and sold it at the profit of 9 %. Find the overall profit/loss? 3. The amount obtained on Rs. 32000 at an interest 4% per annum compounded annually for certain period of time is Rs. 35995.648. Then find the time in years? 4. A, B and C started a business by investing an amount of Rs. 45000, Rs. 65000 and Rs. 70000 respectively. After 3 months, A invested Rs. 15000 more and B withdraw Rs. 5000. And after 4 months, C withdraws Rs. 15000. If the total profit at the end of the year is Rs. 114405, then find the share of A? 5. In three numbers, the first is twice the second and thrice the third. If the average of three numbers is 99, then the first number is? Let the first, second and third number be a, b and c.
Directions (Q. 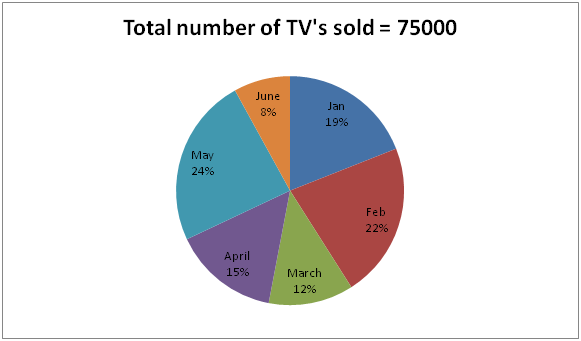 6 – 10): Study the following information carefully and answer the given questions: The following pie chart shows the total number of TV’s sold in different months and the table shows the ratio between the total number of TV’s sold by LG and Toshiba Company. 6. Total number of TV’s sold in the month of Feb and June is what percentage of total number of TV’s sold in the month of Jan, March and May together? 7. On which month, the highest number of LG TV’s sold? The highest number of LG TV’s sold in the month of Feb.
8. Find the ratio between the total number of Toshiba TV’s sold in the month of Jan, Feb and March together to that of total number of LG TV’s sold in the month of April, May and June together? 9. Find the difference between the total number of TV’s sold in the month of March to that of total number of LG TV’s sold in the month of Feb and May together? 10. Find the total number Toshiba TV’s sold in the given six months? 1) A can finish a work in 12 days. B can finish the same work in 8 days and C in 15 days. A and B start the work but they leave after 4 days. How many days C will take to finish the remaining work? 2) Anil purchased a computer for Rs. 35000 and sold it at a loss of 8 %, with that money he purchased another computer and sold it at the profit of 9 %. Find the overall profit/loss? 3) The amount obtained on Rs. 32000 at an interest 4% per annum compounded annually for certain period of time is Rs. 35995.648. Then find the time in years? 4) A, B and C started a business by investing an amount of Rs. 45000, Rs. 65000 and Rs. 70000 respectively. After 3 months, A invested Rs. 15000 more and B withdraw Rs. 5000. And after 4 months, C withdraws Rs. 15000. If the total profit at the end of the year is Rs. 114405, then find the share of A? 5) In three numbers, the first is twice the second and thrice the third. If the average of three numbers is 99, then the first number is? The following pie chart shows the total number of TV’s sold in different months and the table shows the ratio between the total number of TV’s sold by LG and Toshiba Company. 6) Total number of TV’s sold in the month of Feb and June is what percentage of total number of TV’s sold in the month of Jan, March and May together? 7) On which month, the highest number of LG TV’s sold? 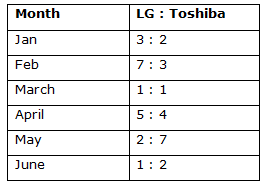 8) Find the ratio between the total number of Toshiba TV’s sold in the month of Jan, Feb and March together to that of total number of LG TV’s sold in the month of April, May and June together? 9) Find the difference between the total number of TV’s sold in the month of March to that of total number of LG TV’s sold in the month of Feb and May together? 10) Find the total number Toshiba TV’s sold in the given six months?